You Might have seen this before. If you have I apologise for repetition. I am absolutely staggered! What will they think of next? But what a good idea! A new initiative is about to be put in place to further the cause of left handed people. My Mole at the Ministry, henceforth to be known as Mmm has heard that among the various schemes is one which will revolutionise lettering as we know it today. The cost is likely to run into £billions. It seems that from this date in 2014, all left handed children will be allowed, nay, encouraged to write from right to left on the page. Not only this, but all Government generated literature will not only include the myriad translations as it now does, there will need to be backwards versions, even in Braille. My immediate thought was GREAT! 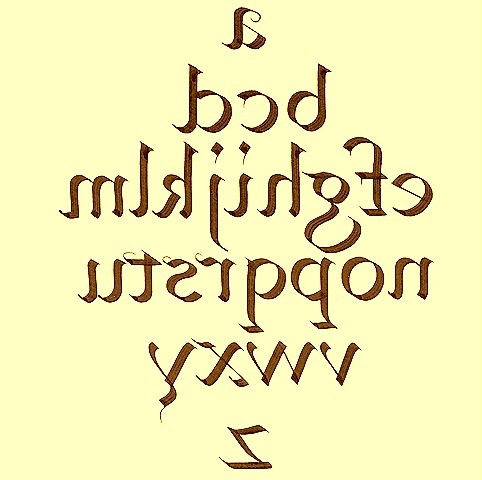 Now we might have a new generation of calligraphers with the knowledge and skill to guide left-handers along the way. Until now they have had to try much harder than their right handed counterparts. It can be done though with sheer grit and determination. I have seen some wonderful work executed with the left hand. Mmm also hears that a competition is forthcoming, with Big Money Prizes! to design the new LH alphabets. Mine is submitted below. I thought I would share this with you, hopefully give you something to giggle about. Remember, you saw it here first. This entry was posted in Uncategorized and tagged calligraphy, left handers. Bookmark the permalink. Thanks Richard. You can fool some of the people some of the time. Heheh! Not you though, it seems.